A study published in the Proceedings of the National Academy of Sciences tested understanding between two groups. Westerners were compared to semi-nomadic people from a remote area of Namibia in southern Africa. The researchers found sounds indicating negative emotions were widely understood by both groups but positive emotions were mainly culture-specific. 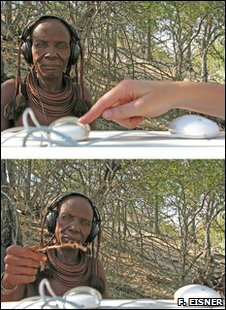 Dr Disa Sauter from University College London travelled into remote northern Namibia to find members of the semi-nomadic Himba people to take part. "It was important to find a group which had not had cultural exchanges with other groups," said Dr Sauter. Both groups enjoyed the experiments. "The people we tested seemed to find the task hilarious. It was fun to do a task that most people enjoy, which for psychology experiments isn't always the case," she added. The participants were told short emotional stories, for example, a sad one. They were then played two sounds, one sad and one representing another emotion, and asked to match the corresponding sound with the story. The so called "basic" emotions of anger, sadness, fear, disgust and surprise were most identifiable. Happiness was divided up into achievement or triumph, relief, amusement and sensual pleasure. Only amusement, signified by laughter, translated well. "It's rather nice that laughter has this apparent universality and it would make sense," said Professor Sophie Scott, another member of the research team. "Laughter would seem to be found in all human cultures and humans aren't the only mammals that laugh." Professor Scott explained that communicating negative emotions is important. "If I make an angry sound it's important that you should know what that means and if I make a fearful sound it's important you recognise that too because it might be because of something that would scare you too." The scientists believe that positive emotions may not travel as well because they are used in more culture-specific ways to manage social bonds. Cheering for example was not recognised. "If someone tastes something and pulls a disgusted face and goes 'eeeurgh' that's forming quite a different role. It's not to do with group cohesion. It's got a much more basic role saying 'stay away from that'," said Professor Scott. The researchers plan to look next at why some emotional expressions are infectious, such as laughter, and the social role that plays.